Welcome to Hakune Matata Pig Farm! 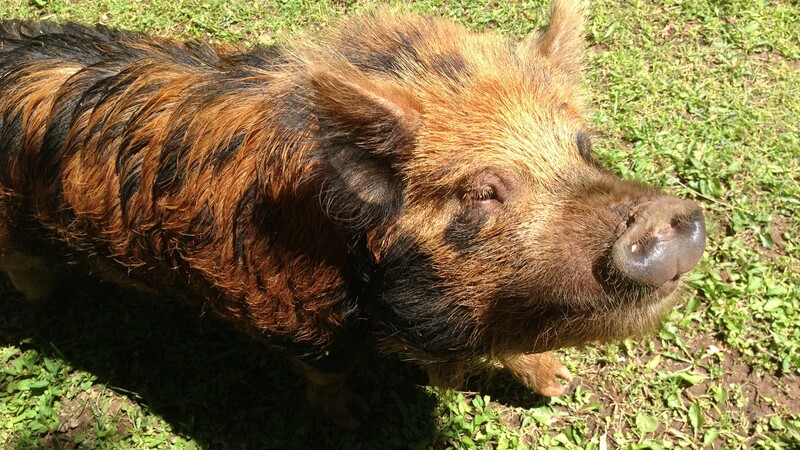 We are a small breeder of Kunekune pigs, which are known for their laid-back, docile, brave, and friendly nature. To learn more about the Kunekune piglets we have for sale, please see our Piglets Available page. Hakune Matata Pig Farm is located on premises at Equine Partners, Inc. natural horsemanship ranch in Penn Valley, California. We are about an hour’s drive from Sacramento, California, and less than two hours from Reno, Nevada, in the beautiful Sierra Nevada foothills. Our Kunekune pigs are part of our daily operations, providing lawn mowing services and weed patrol around the ranch as well as helping our horses become accustomed to different types of animals. They eat grass pasture, grass hay, and pig pellets, and they love whole fresh fruits and vegetables. Kunekune pigs gain weight very easily so we are careful not to overfeed. They are very clean and dislike dirty straw, although they do naturally protect themselves from sunburn, bug bites, and hot weather by coating themselves in clay. Kunekunes are native to New Zealand and were traditionally raised by the Maori people for meat. In the United States, they are often used for pets and companions, for cleaning up weeds and fallen fruit in orchards and vineyards, and for meat. Their gestation period is 3 months, 3 weeks, and 3 days. Here’s a video from Disney about the Kunekune pigs that live at Disneyland. Gilt. A young female pig who has not had a litter. Sow. An adult female pig who has given birth to piglets. Boar. An adult male pig. Stag. A castrated adult male pig. Barrow. A castrated male pig who has not yet reached adulthood. Hakune Matata Pig Farm is a registered breeder with the American Kunekune Pig Registry (formerly the American Kunekune Breeders Association). do you have any boar male piglets for sale? We do not have any piglets for sale at the moment. We’ll announce litters as we have them, on the blog here and on Facebook. We are hoping for a spring 2018 breeding. Hello we are interested in talking to you about your piglets please give a call 831-278-2281 Mike and Hannah. Strictly a pet pig!